After living in Santa Cruz CA for more than 30 years, I’ve returned to Humboldt County, where I’ve built a new studio and am beginning again. I work primarily as a painter in oils on canvas, but I also play with mixed media on paper, encaustic on panels and make block prints. I think that moving between media allows different parts of my brain and imagination to engage. Travel inspires my work, as does the natural beauty of the world. During the last decade, trips to Asia have been a strong influence, as is my Buddhist practice, the ocean, and whatever is going on around me in the day to day. Paintings begin as drawings made anywhere I am. In filling sketchbooks, I collect images & ideas, bringing them back to the studio to use as references for my larger works on canvas. I begin with an idea, often combining sketches, but the paintings then develop themselves. Oil paint allows the possibility for a piece to keep changing and evolving on the canvas. Gold & silver leaf, as well as stamps and bits of collected papers, are sometimes added to the paint, giving texture & variety to the canvases. I tend to work in series, with one idea leading to another, and I work on many paintings at the same time, as each has it’s own pace & progression. Sizes range from 8″ x 10″ to 4′ x 6′. 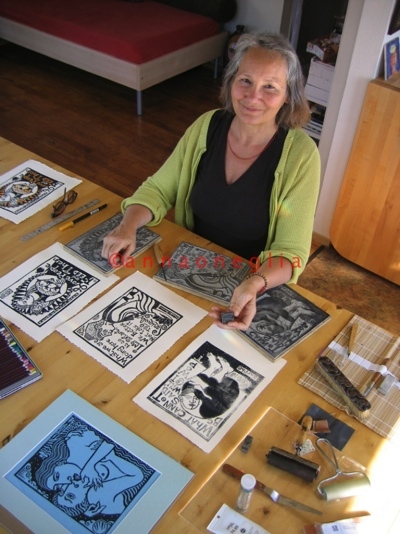 I’ve also been making a series of relief prints since 2004, producing a few more each year. Powered by the combination of words & images, these prints each have a quotation within their designs. I publish them as postcards (which seem to have a life of their own), in hopes of making them accessible to all. I am interested in making art that makes a difference and so often lend my images for publication by a large variety of organizations & causes, including SC Business Aid for AIDS, Bike to Work Week, The National Nurse Midwives Association, Celebration of the Muse, Burning Man, the San Jose & Santa Cruz Women’s Commissions , and Buddhist Bicycle Pilgrimage. Copyright© 2005-2019 · Anna Oneglia · All Rights Reserved · Please do not copy any images without permission.